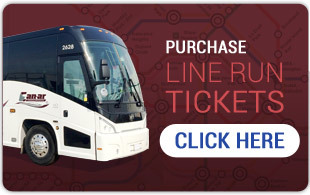 Bus rentals in Toronto, Vaughan, Mississauga, Scarborough and other cities across southern Ontario are known to be one of the safest group travel options available, particularly when riding with Can-ar Coach. Any avid group traveller will tell you that one of the biggest lessons they’ve learned is to never underestimate the importance of finding a safe and secure mode of transportation. Even in a safe country like ours, it’s essential to make sure that you’re taking a risk-free route when group travelling. Summer is almost upon us and friends are sparking plans to travel all around Ontario for weekends of shopping and perusing the casino. If you and your group are thinking of embarking on a weekend at the casino in Niagara, Woodbine, Grand River, Woodstock, Kawartha, Georgian or any other of OLG’s local destinations, Can-ar Coach is not only the most comfortable and efficient service with the most value, but our fleet also provides the safest ride to your weekend getaway from Toronto. Our vehicles are all top-of-the-line and regularly inspected and improved to ensure they are in the best condition possible, and our seasoned drivers have been thoroughly trained, creating a safer way for your friends’ night out. So the only thing that needs to be on your mind is your casino itinerary! Can-ar Coach specializes in group travel throughout Toronto, the gateway of Niagara Falls and the economic heartland of Canada. Since our foundation over three decades ago, we have perfected the art of transportation and worked to create a safe and comfortable environment for those who choose to travel with us. To ensure an easy and enjoyable experience on the road to your next summer weekend getaway, call Can-ar today!